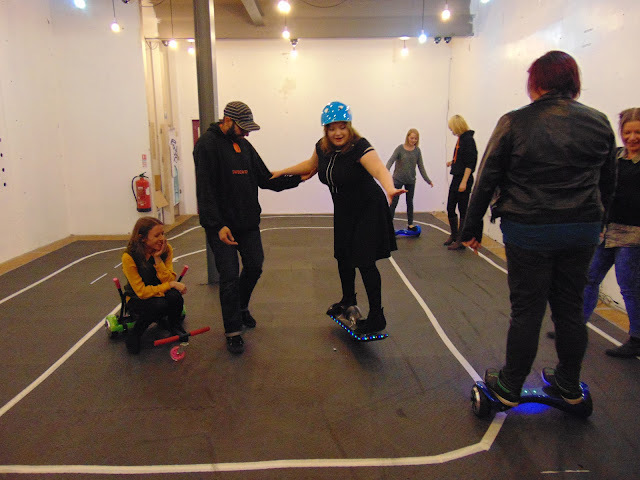 Recently I was invited to a great event in Sheffield to find out more about Swegway - and even give them a little cheeky try out. Swegway are the company which brought Hoverboards to the UK back in August 2015 and they are the only online retailer of the product who have a physical store which you can visit to try them out. Now, i say Hoverboards but they do have wheels, although it definitely doesn't feel like that when you're trying to balance on one without going flying off backwards! Before the event I met up with a couple of other friends who are also Sheffield bloggers and we grabbed a drink next door in The Forum while trying to figure out what the evening would bring. I haven't been to an event for a product like this before so i was very curious about what we would possibly be doing. On arrival, we met the team at the Swegway store, grabbed a drink and some nibbles and then the evening got underway. 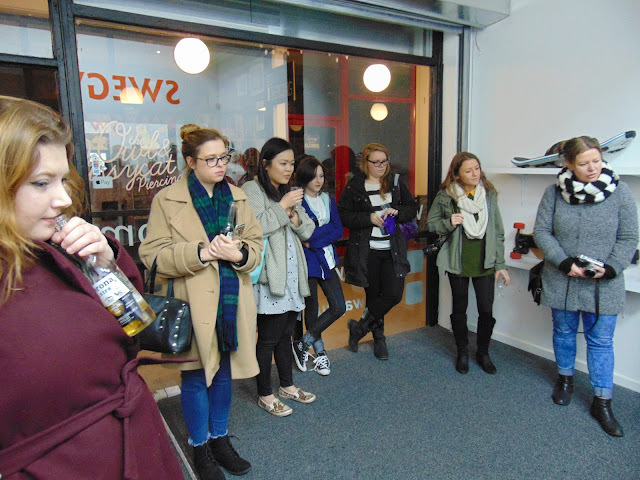 First, we learnt a bit more about the different types of Swegway - did you know for example, you can get them with built in bluetooth and speakers so you can be one of those annoying people who play music really loudly in public. Please don't be one of those people. 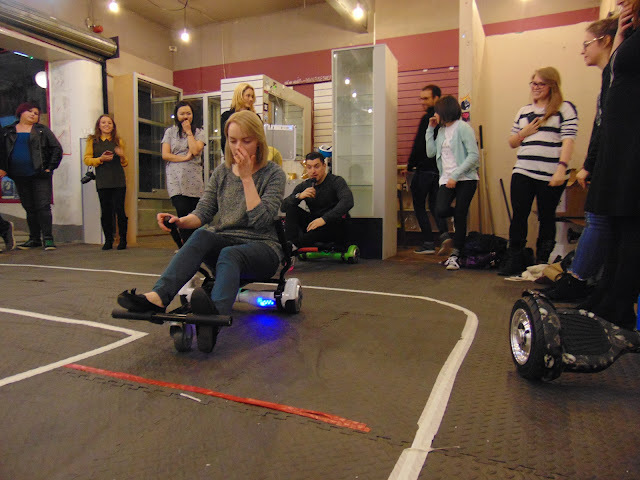 After a quick demonstration and run through of the products, we were lead to a makeshift racetrack to give us space to test them out before a competition race later in the evening. 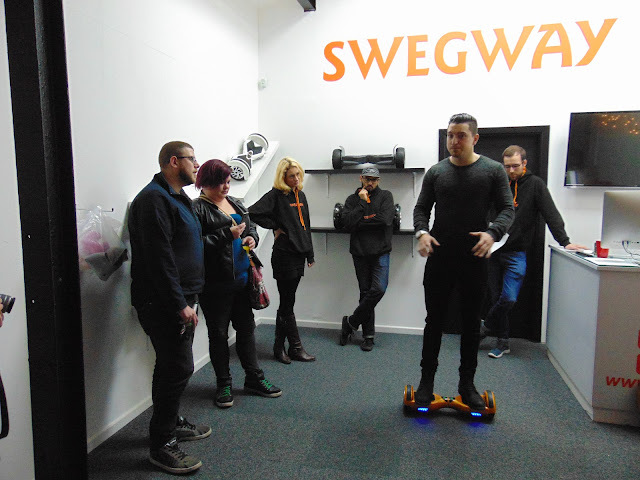 This gave us the chance to have a spin on the different swegway products and get a feel for how they work. Apparently, balancing makes it harder so you have to go against all of your instincts when you get on one for the first time. On my first try, i held on to someone for dear life until i thought i had got used to how it worked. Turned out, the one we were trying wasn't calibrated correctly so when i tried out another Swegway, it was so much easier to use. It felt so surreal to be gliding around without holding onto anything and the slightest pressure forwards or backwards from your feet could move you left, right, forwards or backwards. Overall, i had such a good laugh at this event and it was completely different to any event i have been to before. It's safe to say i would love to have another try on one of the boards and become and expert at it! If you want to know more about Swegway and have a look at all the products they offer, you can find all the information on their website here.